May 2016 – Our Canadian Rockies RV trip had been sensational so far, with visits to Banff, Jasper, Kootenay and Yoho National Parks. But these National Parks are also world renowned, and at times the whole world seemed to be there with us. 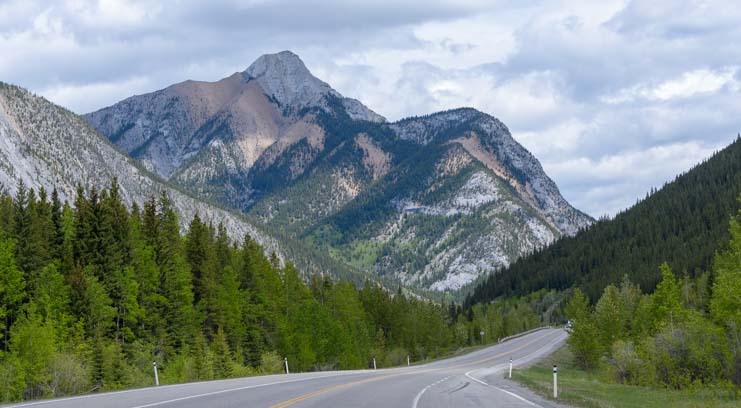 Fortunately, another part of Canada’s Rocky Mountains a little ways off the beaten path is just as as wonderful for an RV trip: Kananaskis Country. 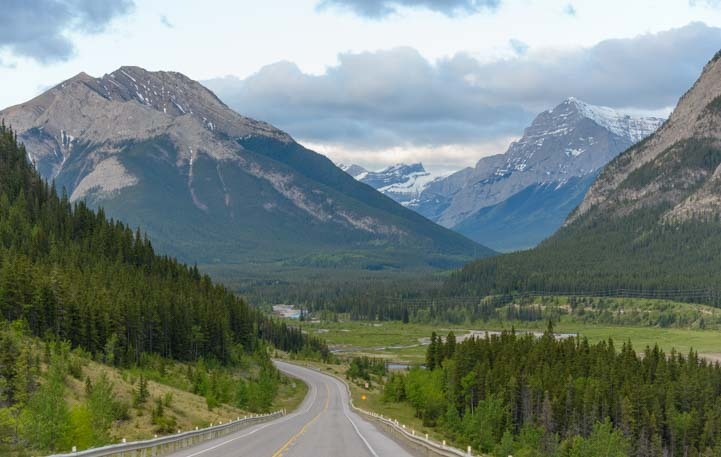 The first big view driving down the Kananaskis Trail on Route 40 – Wow!! 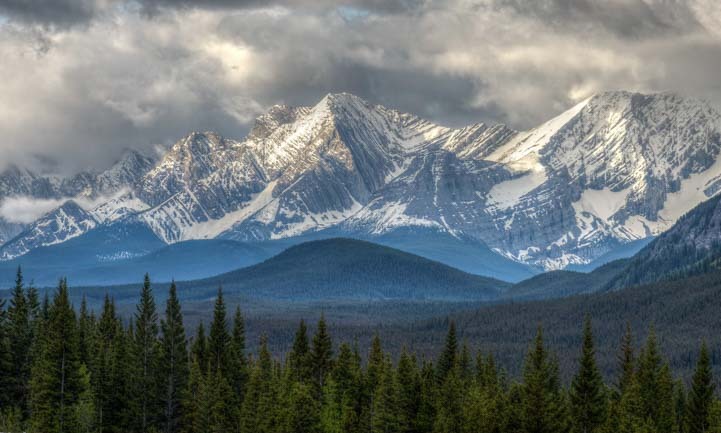 Located in the mountains to the south of Canmore, Kananaskis Country is in the foothills and front ranges of the Canadian Rockies. Less than an hour west of Calgary, it is a popular playground for city folks to get away for the weekend, but it’s not a primary destination for the tour bus crowd. 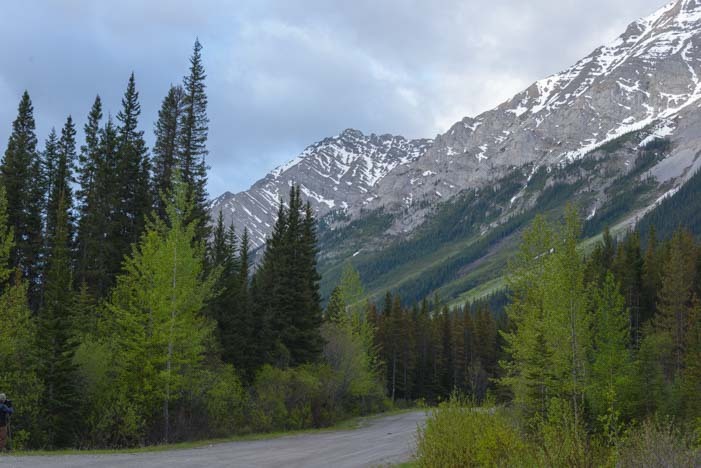 Kananaskis Country is not as well known as the National Parks further west, so the roads are quieter. 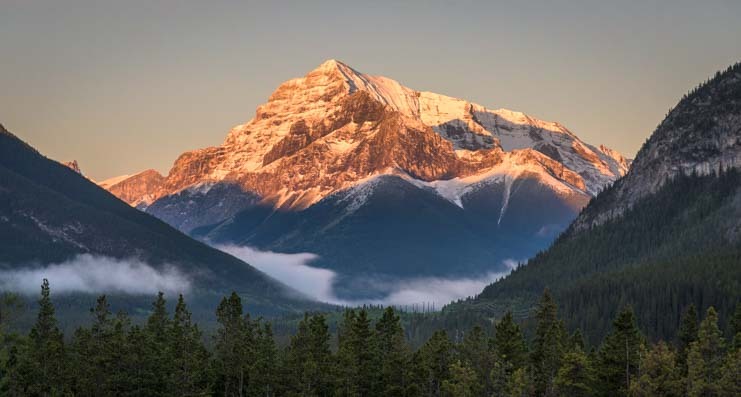 In the 1988 Winter Olympics in Calgary the downhill ski racing and mogul skiing competitions were held in Kananaskis Country, and the area is loaded with campgrounds and parks and all kinds of outdoor activities. 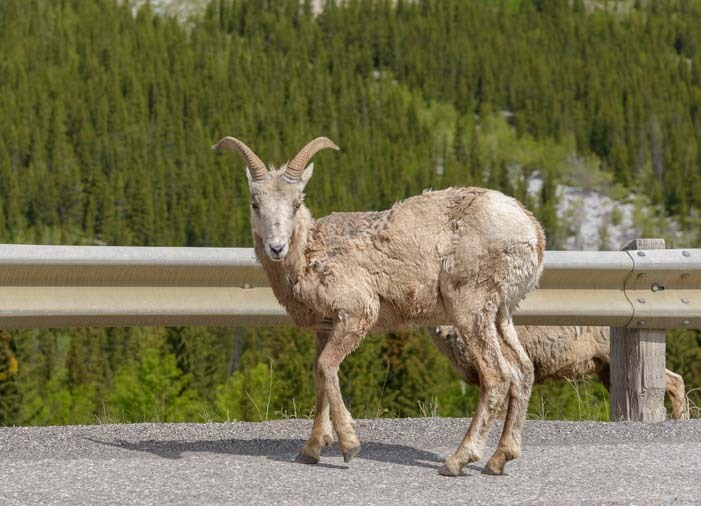 As we drove along the Route 40 on the gorgeous scenic drive that runs through the middle of Kananaskis Country, we noticed a little yellow sign for bighorn sheep. Bighorn sheep live in these gorgeous mountains! 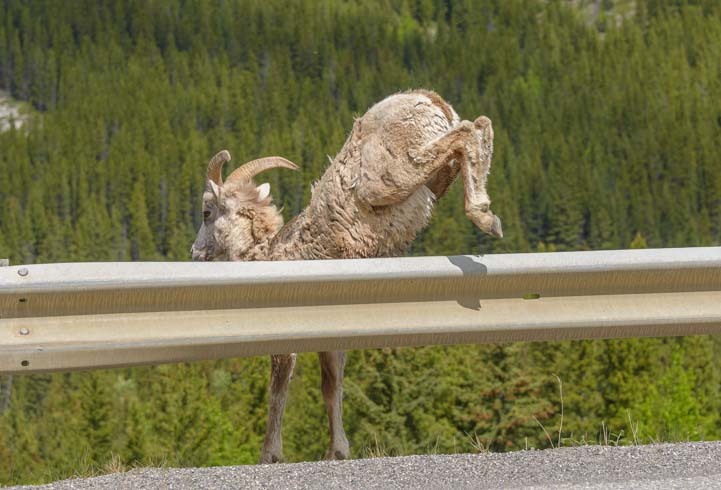 It wasn’t long before we spotted a bighorn sheep on the side of the road. 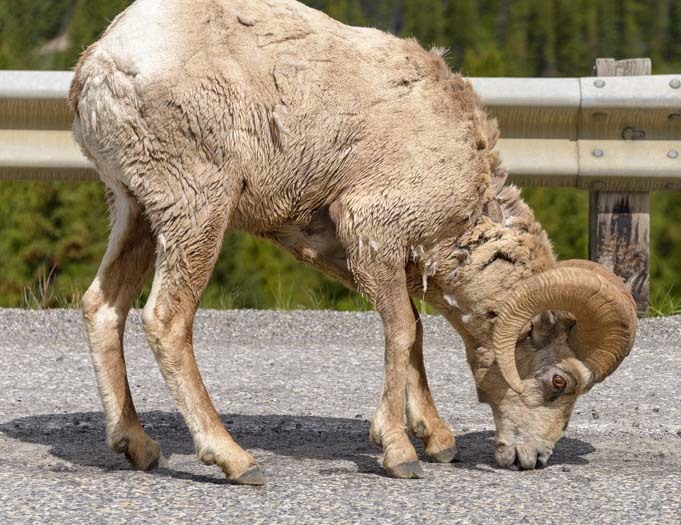 Route 40 is so quiet in the mornings that we were able to pull our truck over to get a look at this handsome ram, and we watched him nibbling something on the pavement for quite some time without any other cars going by. Something on the pavement is pretty yummy! He wasn’t alone, and we noticed his girlfriend was watching us. The big ram’s girlfriend checked us out. 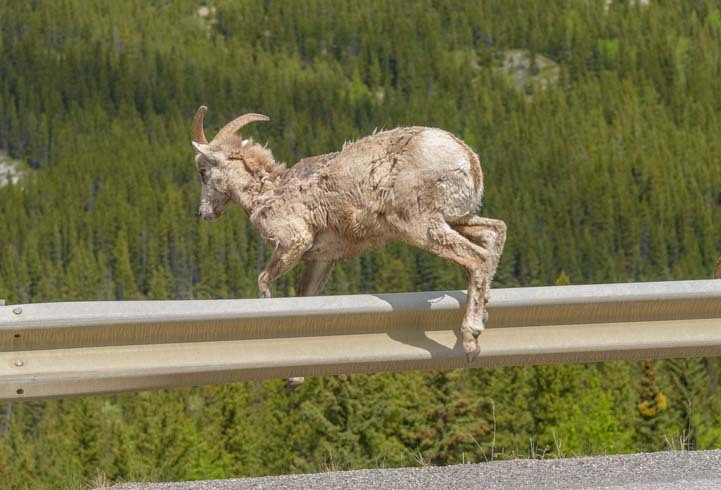 Suddenly, she decide to hop to the other side of the guardrail. She jumped over it with effortlessly and with grace. Oops – She wants outta here! 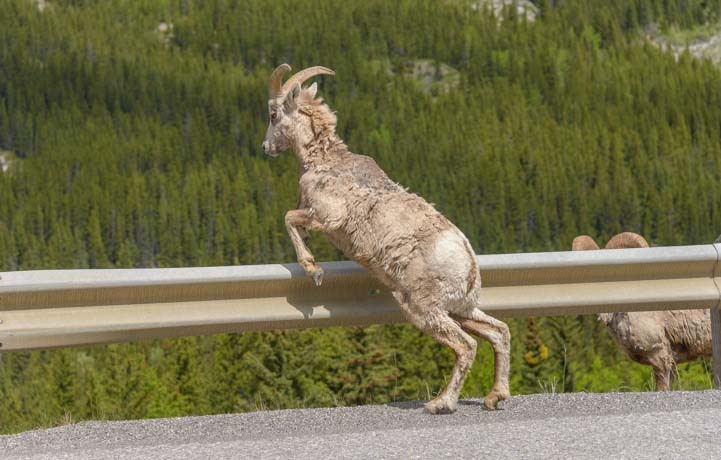 We had enjoyed some fabulous encounters with bighorn sheep during our stay in Canada’s Rocky Mountains, seeing them near Radium Hot Springs when we first arrived in the Rockies and again while driving around the outskirts of the city of Banff. And no wonder. 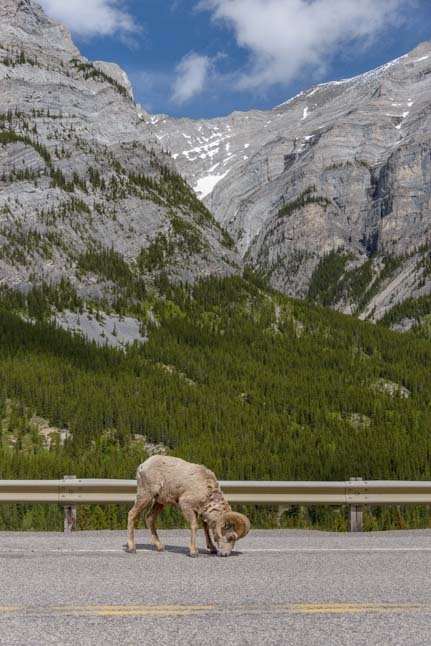 The Latin name for Bighorn Sheep is Ovis Canadensis, undoubtedly because they are so plentiful in Canada (even though their range goes all the way down the Baja peninsula). Given the “Canadensis” in their Latin name, maybe we should be calling them Canada Sheep just the way we refer to the big birds Branta Canadensis as Canada Geese! 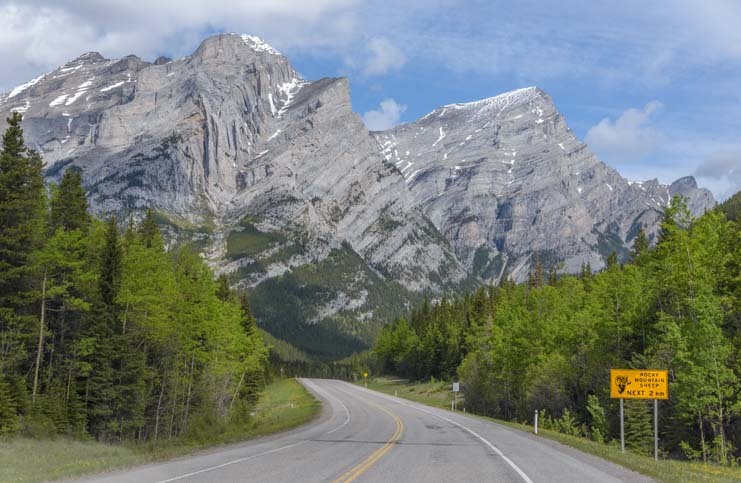 Either way, Route 40 through Kananaskis Country passes by endless scenic pullouts and spots to enjoy the view, a picnic or a hike. And the road itself would be awesome for cycling. 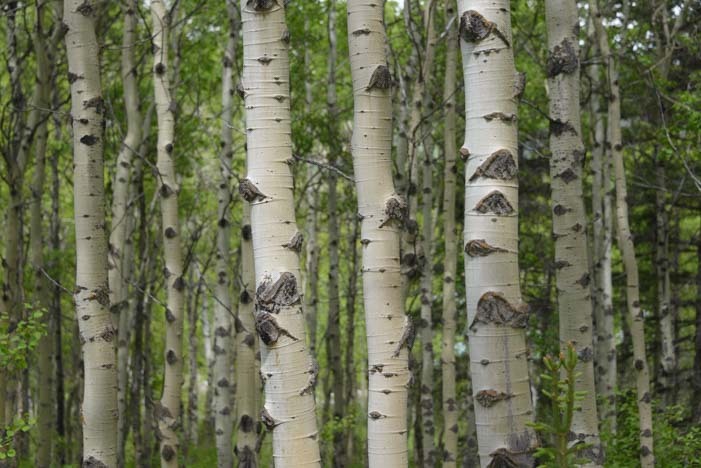 It’s also a wonderful area for photography, and we had fun wandering around a stand of aspen trees. Kananaskis Village is the resort center in Kananaskis Country, and in 2002 it was the site for the G8 summit. What a place to try and solve all the world’s problems! The once spectacular Kananaskis Country Golf Course is right next door to Kananaskis Village. Unfortunately, a huge flood in 2013 washed much of the golf course away. It is being rebuilt, but it was a little sad to wander past the clubhouse and through the grounds of what once was, and probably will soon be, a gorgeous resort golf club. At the moment, however, there is a lot of dirt and mud everywhere, along with backhoes, and weeds are taking over the landscaping. away from the mud and backhoes. As with scenery anywhere, sunrise and sunset make everything look their best, and we staggered around in the pre-dawn hours with our cameras capturing a magenta sunrise one morning. The sky lit up in vivid pink for a few minutes – incredible! Being so far north in the final days of May, we found the sky wasn’t getting dark until midnight and it was getting light again around 4:00 in the morning. Oof! We really wanted to do more photography at sunrise and sunset, but gosh, those are tough times of the day to be out running around! But what we did catch was breathtaking. This was worth getting up for! As had been the trend for the last few weeks in our RV trek through Canada, the temps had been getting cooler, contrary to springtime norms, and storm systems filled the skies as well as the weather forecast for the next 10 days. The area was stunning even when storm clouds threatened. Bad weather does make for great photography, though, so we had fun playing with the dramatic skies and mountain peaks. But we decided to head south to get to warmer weather. 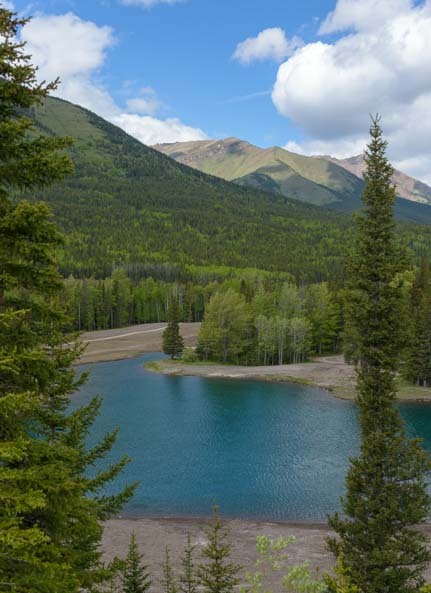 Kananaskis Country is a picturesque area that is rich with possibilities for all kinds of outdoor activities in the mountains, so we’ll be back again to explore a little more. Kananaskis Country is great for an RV adventure! 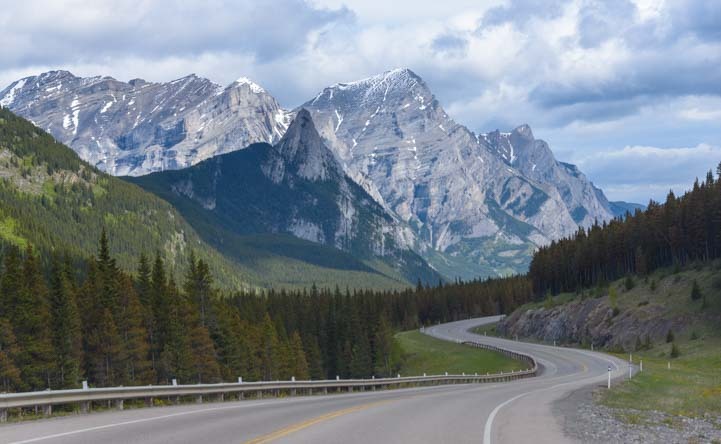 If you take your RV into Kananaskis Country, the best place to stay is Mt. Kidd RV Park which has several big loops and room for big rigs. Site amenities range from full hookups (bigger sites) to no hookups (smaller sites). We’d like to thank our RVing friends Larry and Jacquie for telling us about this beautiful area. We met them when we saw their fun Grinch Christmas decoration in front of their motorhome at Monte Vista RV Resort in Arizona last winter. 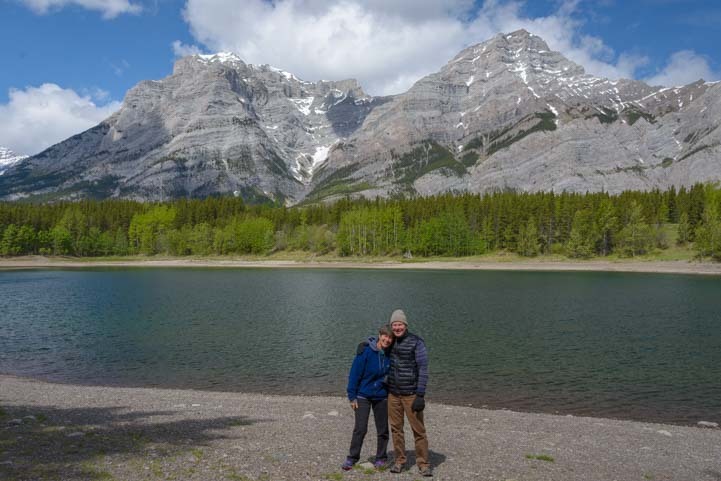 They once lived in Calgary for five years and when we said “We’re going to the Canadian Rockies,” they said, “Don’t miss Kananaskis!” Thank you!! Tips for RV travelers heading to Canada – Gas prices, border crossing, internet access, etc. This entry was posted in Canada and tagged Canada, Canadian Rockies, New, Travel, WP Travel by Roads Less Traveled. Bookmark the permalink. “An Ansel Adams view” in true Ansel Adams color! Beautiful shot. Thank you, Mike. That was Mark’s special creativity in action there! What a gorgeous place, and even better that it’s not overrun with tour buses! 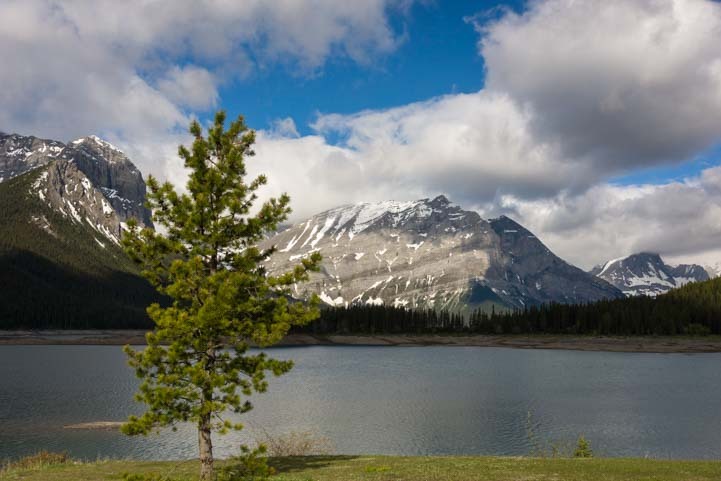 I’ve never heard of Kananaskis Country—thank you for sharing your amazing photos (and even a tip on a place to stay). 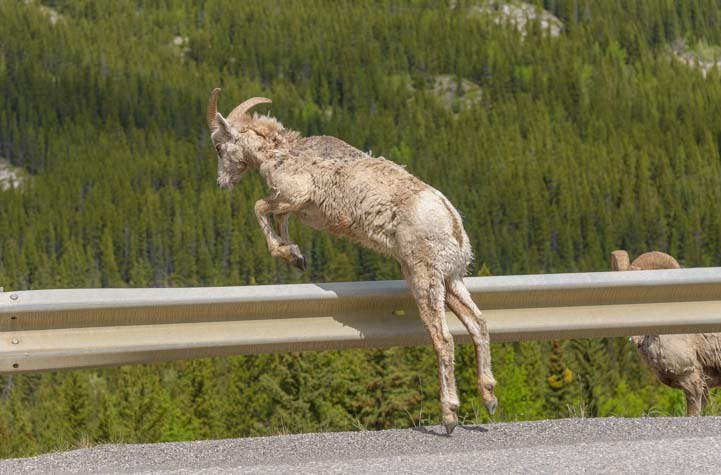 Great shots of the bighorn sheep. It’s a beautiful area, Laurel. You would love it there! Hi Randy – I remember your email and hope you had fun on the Blue Ridge Parkway with your motorcycle. From Island Packet to Airstream – very nice! You’ll have a great time with your new trailer on the caravans and on your Rocky Mountains trip next summer. All of our travel posts are organized by destination in the menus above, broken down by state. In the states where we’ve done a lot of travel, like Arizona and Utah, they are further broken down by region when you click on the state. For chronological listings, our most recent year of travel posts (plus a link to all our travels since we started) is under the “Latest” menu item. To help readers get oriented as to what’s where on this blog (tech posts, lifestyle posts and travel posts), there’s an explanation of the blog’s structure on the page RVers Start Here!